Genesis has only three models in its lineup at present, and they're all sedans. Luxury sedans, of different sizes. But it's been rolling out a stream of concepts to preview how it might expand its model line in the future, and it's bringing a new one to the 2019 New York Auto Show this month. "You'll have an electric show car for Genesis" at the Manhattan expo, Hyundai Group design chief Luc Donckerwolke told CNET's Roadshow at an event in South Korea late last week. Unfortunately, that's about all we have to go on at the moment. The venue Hyundai has chosen to unveil the new luxury electric vehicle concept should come as little surprise. It's the same show where it unveiled the Essentia coupe concept last year. It revealed the GV80 crossover concept at the same show the year before, and an otherwise unnamed New York concept the year before that, just months after its founding as a standalone brand under the Korean automaker's umbrella. Those three concepts are the only ones the brand has shown to date, and they've all appeared at the Javitz Center before they've appeared anywhere else. And so will the next one. It's a bit of a different strategy to what Hyundai pursued, in geographical terms at least, prior to the Genesis brand's emancipation. Previous luxury concepts like the Vision G, HND-9, and HCD-14 were unveiled in LA, Detroit, and Seoul. The emphasis on New York tells you something about the client base the brand is pursuing. 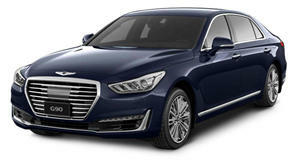 Alongside the electric-vehicle concept, Genesis will also reportedly show an updated version of its flagship G90 sedan. Sister brand Kia will reveal a new concept there as well, and Hyundai's core brand will showcase the new Venue crossover alongside the latest Sonata sedan.